HOUGHTON — Synthetic chemicals are ever-present in modern life — in our medications, cosmetics and clothing — but what happens to them when they enter our municipal water supplies? We may assume they cannot harm us after we flush them away. However, most water treatment infrastructures were not designed to remove synthetic organic chemicals, such as those found in opioids, personal care products, and pharmaceuticals. Consequently, trace concentrations of those chemicals are present in effluent, the water discharged from treatment plants into lakes, rivers and streams. Although found in extremely small concentrations, just nanograms or micrograms, the toxicity is not well understood in human bodies and ecosystems. Worse, we know even less about the effects on human and ecosystem health of byproducts created during advanced oxidation water treatment processes — thousands of chemical byproducts can be created in just minutes. Therefore, it’s crucial that scientists and treatment plant managers understand the mechanisms by which chemical byproducts are created during the treatment process. Daisuke Minakata, assistant professor of civil and environmental engineering at Michigan Technological University, with coauthors Divya Kamath and Stephen Mezyk, sought to understand those mechanisms using acetone as a test case. Their results are published today in the article, “Elucidating the Elementary Reaction Pathways and Kinetics of Hydroxyl Radical-Induced Acetone Degradation in Aqueous Phase Advanced Oxidation Process” (DOI: 10.1021/acs.est.8b00582), in the scholarly journal Environmental Science and Technology, published by the American Chemical Society. By chemical standards, acetone has a straightforward structure. This makes it ideal for modeling reaction pathways — the myriad ways a chemical can degrade into free radicals and byproducts — to predict which byproducts form. Advanced oxidation is an effective and an important way to treat water and effluent, so its use should not be discontinued. Many communities in arid regions are running out of water and must reuse treated wastewater — a process called direct potable reuse. If synthetic organic chemicals and their oxidized byproducts are not removed from the water, people and animals consume them. In the Great Lakes region, upstream communities discharge treated wastewater into lakes and rivers. People living downstream use that water; and existing, conventional treatment processes do not remove all organic chemicals effectively. Advanced oxidation can effectively target specific organic chemicals to remove them from water. Modeling reaction pathways is critical to help water treatment managers understand how best to wield the knife. A limitation of the work is that the model applies solely to structurally simple organic contaminant like acetone, rather than broadly to multiple chemical degradation processes. Organic chemicals have extraordinarily complex structures, and we lack the computational capacity to calculate the reaction pathways. 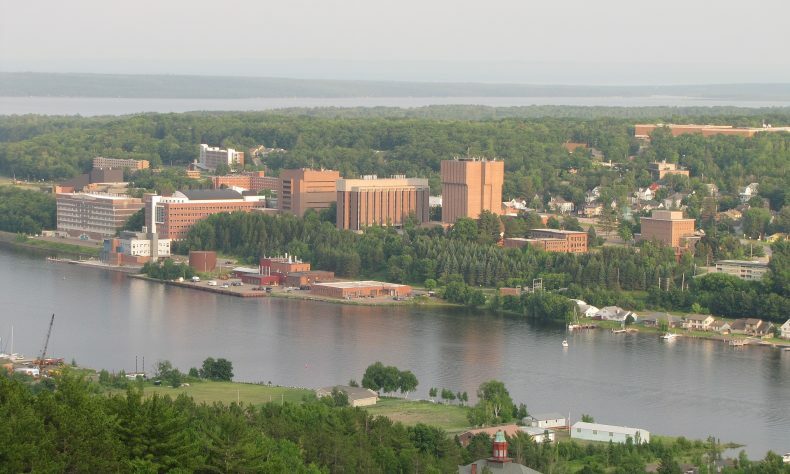 Minakata’s team used the Superior supercomputer at Michigan Tech. Superior puzzled away on the acetone pathways with hundreds of calculations — some of which can take more than weeks. Understanding the mechanisms of chemical byproduct formation isn’t just important for water treatment; it’s also advancing what we know about chemical reactions in the atmosphere and inside our bodies.